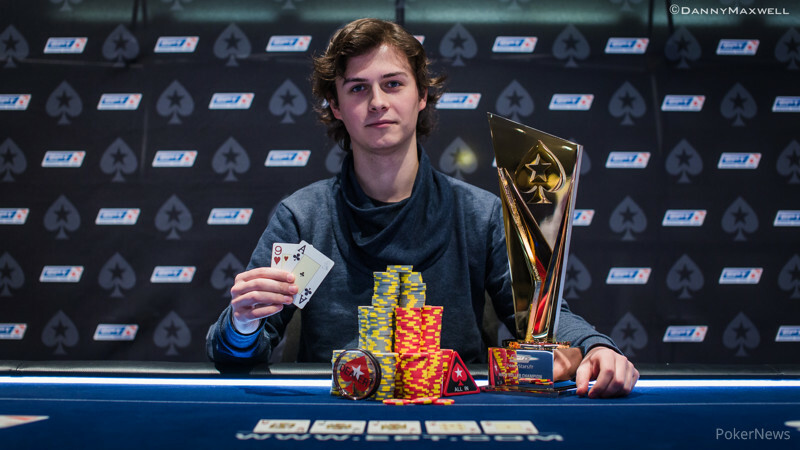 After a relatively short final table, Dominik Panka has been crowed the PokerStars.fr EPT Deauville High Roller Champion, beating a record-breaking field to claim the first prize of €272,000 on a final table that lasted just six hours. 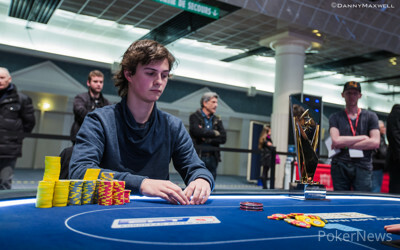 Panka beat Albert Daher heads-up after a short battle that was still keenly contested. The final two players were the dominant stacks at hugely tough looking final table that featured no less than four former EPT Champions, the WSOPE Main Event winner Adrian Mateos Diaz and Ondrej Vinklarek who was EPT Season 8's Player of the Year. 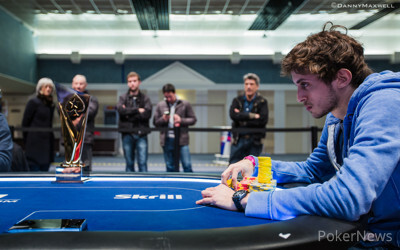 Between them, Panka and Daher eliminated all the other players on the way to their heads-up battle. Diaz was the short stack coming into the final table and the first player to be eliminated. He raised and then four-bet all in with against Panka's three-bet. Unfortunately for Diaz, the PCA Champion called with which held on a board. Despite this, it's still a good start to the year for the Spaniard who picked up two trophies at the GPI European Poker Awards a few days ago. Russian Nikolay Losev, who had not had a recorded cash for over two and a half year was the second man out at the feature table, a check-raise all in on the turn was called by Daher's top pair and the board bricked out. This increased Daher's chip lead briefly but with the advent of six-handed play, Davidi Kitai stepped up and began to spar repeatedly with Daher, winning the majority of hands. Kitai managed to hold the chip lead for a spell but he twice tried to bluff Panka when the Pole held aces, the second time would also become the last. Kitai ended up five-bet shoving all in with and could not conjure up a miracle board against Panka's when the board came . Panka took the chip lead for first time as result. 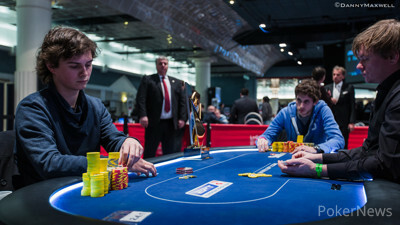 Immediately following the Belgian's exit, former EPT champion Martin Schleich was the next man heading to the rail. Again aces were the cause as Daher picked them up to knock out the short-stacked German. This left four players, Panka, Daher, Kent Lundmark and Ondrej Vinklarek with the latter two being the short stacks. Vinklarek was eventually eliminated when his push over Daher's button raise was called by the Lebanese player's . Vinklarek showed and was briefly ahead on the turn of a board before the , usually such a harmless card, was put out on the river to dismiss the Czech player. As Daher and Panka continued battling each other intently, Lundmark was simply trying to keep afloat. Finally the Swede moved all in with from the small blind and Panka gave him a spin with in the big blind. Both made a pair but no more on the board. Panka began the heads-up battle with the lead but it was barely four big blinds, so evenly-matched were the two. Daher took the lead at first but two crucial pots both went the way of the Polish player. Daher was crippled as a result and victory for Panka came soon after! The next EPT High Roller event will be in Vienna next month, hopefully the Pokernews Live Reporting Team will see you there. Remember that the main event is still ongoing and you can follow all the action here. Until then, it's over and out from Deauville! There were no more flops to be seen as the two players alternated between shoving and folding. After a few hands Dominik Pańka looked over at Albert Daher’s miniscule stack and made a comment to the effect that he had been making a mistake giving him a walk. Pańka was on the button and moved all in. Daher tossed his chips in to call. Pańka had and Daher the . The flop was giving Daher top pair, but there was no celebration. There were two more cards to come, the turn and the river . Pańka had started with the best hand and made top pair to finish with the best hand. Albert Daher raised to 80,000 and Dominik Panka called in the big blind. The flop was and Panka checked, Daher fired 100,000 and Panka made the call. The turn was the and Panka checked a second time. Daher tried a second bullet, 230,000 this time. Panka thought about the hand for longer but made the call once more. The on the river didn't seem to change much and Panka checked a final time. Daher took a moment and then bet a substantial-looking 700,000 leaving himself barely 200,000 behind. The Polish PCA Champion tanked for several minutes before quietly announcing "Call." Daher was forced to turn over for a pure bluff and Panka's call had been made with . Daher has about five big blinds left and is needing a Lazarus-like resurrection. Albert Daher is attempting to mount a comeback, he's picked up a couple of pots and shoved for around 1.2 million after Dominik Panka raised to 80,000. Panka said,"For 30 bigs? Really?" The Pole gave it some thought before eventually giving up his hand. First hand of the level and Dominik Pańka three-bet Albert Daher from the small blind and took it down on the flop. Second hand Daher folded the big blind to an open from Pańka. Third hand of the level Daher opened for 80,000 and Pańka elected to call. The flop was . Pańka checked, Daher bet 100,000 and Pańka three-bet him to 285,000. Daher made the call and they saw a turn card of . Pańka now led for 495,000 which Daher called. The river card was the . Pańka stayed composed and announced he was all in. The red triangle was thrown in front of him and Daher thought it over. 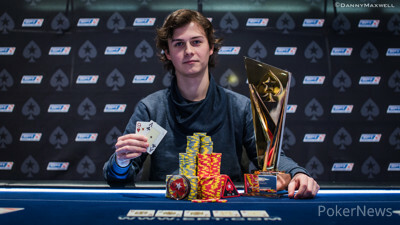 He had 1.1m left and it was a big pot; in the end though he folded his cards to give Pańka a significant advantage. The two remaining players are having a short 20 minute break. 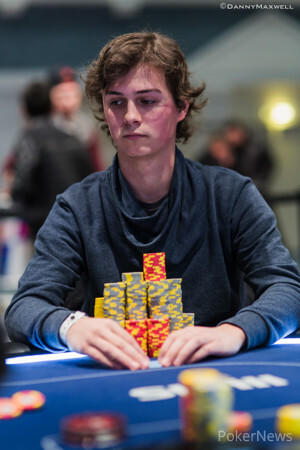 The preflop betting got to 190,000 with Dominik Pańka the aggressor out of position. Albert called and they saw a flop of . Both players checked. The turn card was and Pańka, as is his style, took his time and bet 160,000. Daher called and the river was the . Pańka bet 380,000 and Daher rested his head in one hand, thought about in a short while and folded. He said across the table to Pańka that he’d laid down a big hand.